(186 x 264 mm) 8.3 x 11.7 in. (186 x 264 mm) 11 x 14 in. Originally painted in the early 1990’s as part of a set of five greetings cards, then later as a postcard, this image of the Wish Fulfilling Tree proved to be extremely popular. And now made available as a signed and numbered Giclee print, the colour balance of the actual print is softer and more subtle than the watermarked image that appears here. This symmetrical tree is composed of many auspicious and precious elements, with a wide variety of flowers, buds and leaves, with clusters of triple-gems and triple-fruits forming its dense canopy. Rainbows emanate from the jewel-hearts of the five lotuses at the top, representing the Five Buddha Families, with the discs of a white moon and golden sun appearing as the polarity symbols of method or skillful means and pristine awareness. A necklace of Tibetan etched agates or Gzi stones, a silk scarf, multicolored silk valances, loops of precious gemstones, and jewel chains bearing rubies and rudraksha beads, with little silver bells hanging below. A blazing eight-faceted gem appears at the heart of the tree, with pairs of auspicious white pheasants appearing on either side. 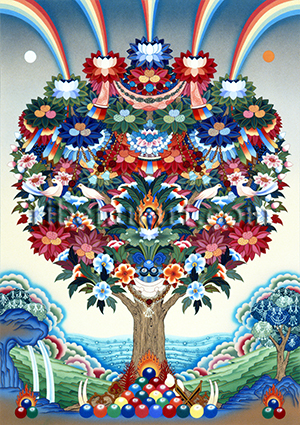 A stack of round multicolored jewels appears at the base of the tree, with the eight emblems of the chakravartin or 'universal monarch' appearing behind. The Vedic motif of a great Wish-granting or 'World Tree' is common to the Hindu, Jain and Buddhist traditions, where it is known as the Kalpavriksha or Parijata tree, which is often likened to the beautiful Indian coral, magnolia, frangpani or champaka tree. It is sometimes described as having golden roots, a silver trunk, lapis-lazuli and coral branches, and gemstone flowers, buds and fruits. An exquisite example of such a fabled wish-granting tree is depicted in the ‘Amitabha in Sukhavati’ thangka that appears in the Buddha and Bodhisattvas gallery of this website.